The low-profile launch of the ASEAN Community may be a sign of maturity. On December 31, 2015, ASEAN launched its long-anticipated Community with relatively little fanfare. This low-profile attitude surprised many observers: announced as a milestone and the signal of the member-states’ determination to bring regional cooperation “to a higher plane,” the launch was indeed modest, even imperceptible. It is unlikely that this low-key approach was a misunderstanding, a failure, or the imperative of a problematic domestic political agenda for chair Malaysia. Rather, it was more likely the realistic acknowledgment of the need to avoid raising expectations. ASEAN leaders take seriously the need to address the widening gap between their discourse on an ASEAN vision and the reality of this vision on the ground. After nearly 50 years of region-building (ASEAN will celebrate its 50th birthday in August 2017), the nature of the bloc is still a highly debated topic among experts, and the non-event launching of its community provides an argument for those who defend its nebulous substance. This specific substance makes it difficult to ascertain the added-value of a grouping that is, as Kavi Chongkittavorn told the audience during an ERIA-IFRI conference in Paris recently, “like chewing gum: the more you chew it, the more flexible it is” – with the risk of losing its flavor, one should add. 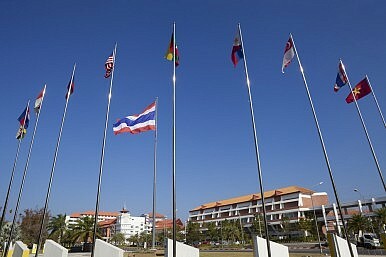 Obviously, if ASEAN contributed to making the region a stable, attractive and prosperous space, through the progressive implementation of a large spectrum of fields of cooperation (and they now are numerous, from education to maritime safety), it failed to convince observers of the political willingness of its member-states to seriously deepening the integration process. Closer scrutiny of the level of engagement on implementation still indicates visible resistance (mostly through unfair practices or the lack of significant improvement in services and investment) and different expectations. For sure, the ASEAN Community is aiming to move towards a “rules-based community” in order to create a more predictable business environment, but make no mistake: If ASEAN is pursuing its “vision,” it is not because of a revisited interest for integration when intra-regional trade doesn’t represent more than 25 percent of the total trade of its members-states. The regional tool is pragmatically activated, as other instruments are. ASEAN has no more importance than the TPP or the RCEP; and indeed, one could argue it has less importance since trade with China, for instance, is a greater factor in their growth rates than intra-ASEAN trade. Almost 50 years on, there is still no “regional preference” and, incidentally, no binding commitments to deliver, and therefore little capacity-building. This voluntary approach is simultaneously a strength – it allows complete control of the process – but also the illustration of a weakness – ASEAN only reflects the aggregated willingness, or in some cases resistance, of political leaders and bureaucrats in Southeast Asia to engage in regional integration. Where do societies position themselves on the issue? If by now, ASEAN is a familiar acronym in the region, surveys still show a low level of public understanding of what the association is all about; the discrepancy between the official discourse and a blurred reality adds to the confusion and produces some unease. People do not feel a sense of participation in the community process and do not “feel ASEAN,” as former secretary general, Surin Pitsuwan, has wished. Different surveys show that ASEAN remains an elitist initiative: the higher you are positioned in your area (in business, academia, the military, for instance), the more accurate ASEAN awareness you have. If there is a more acute sense of community amongst the younger generation – a positive signal when 60 percent of the combined population of ASEAN countries is under 35 – it is only amongst the well-organized segments active in the public sphere. As average citizens do not expect any practical transformation of the ASEAN political community, or benefit from it, declarations on “political transparency, fight on corruption, promotion of democratic norms” are aimed merely at reassuring Western partners. ASEAN plays on the same ambiguity in the security realm. Obviously, thanks to the trust a common framework and institutionalized mechanisms have produced, much has been done to raise the “comfort level” of its member-states. Yet as was noted during the ERIA/IFRI conference, much remains to be done on crucial issues if the association wants to be considered a reliable partner and not only as a bridge builder and a central – and admittedly convenient – interface. True, this function is indispensable and very cleverly optimized: The upcoming ASEAN meetings with Russia (May 2016), with China (fall 2016) and the recent invitation by the Obama Administration for all 10 ASEAN leaders to visit Sunnylands (California) are clear illustrations of the pivotal position ASEAN has acquired in the new power configuration in Asia. The TAC (Treaty of Amity and Cooperation) now has 33 signatories. But could ASEAN support its centrality without going beyond bi- or trilateral security cooperation schemes and provide more reliable substance for its partners? Or does it mean that a nebulous vision allows easier adjustment and fine-tuning when you are confronted with sensitive issues and entangled in a complex network of security partnerships? ASEAN has succeeded in transforming a weak position into an opportunity: Nobody fears the association. It doesn’t mean ASEAN is naïve or irresponsible; it may even signal a more mature perception of its final influence. ASEAN espouses no utopia, and has set no deadline to achieve particular goals, and therefore it is here to stay, facilitating regional cooperation in a divided global environment. “Even at our level, we are useful and that’s what counts,” concluded one speaker from the region at the recent conference. In this challenging environment, we all need a friend, don’t we? Sophie Boisseau du Rocher is a Senior Research Associate at Centre for Asian Studies, IFRI (Paris). The conference was organized in Paris (January 18 and 19, 2016) with the support of ERIA.